Our range of products include mineral water plant. With thorough understanding of the relevant industry, we are offering a wide range of Mineral Water Plant. This plant is manufactured using finest quality components and highly developed technology. 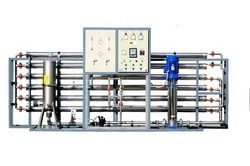 It is mainly used for water purify purposes. In tune with different needs of our copious clients, we modify the entire range in different sizes and other related specifications. Our offered plant has gained outstanding value amongst our clients for its distinct features. Looking for Mineral Water Plant ?